Area Linens are designed by Anki Spets, a Swedish Designer who not only creates the prints on these gorgeous linens, but also the beautiful Jacquard weaves. 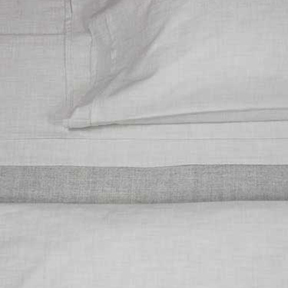 Natural fibers, innovative designs, subtle detail and natural colors are what defines Area Linens. Constructed for comfort, durability and naturally easy care, all of these linens are machine washable, even the cotton/linen blends. "Heather" is a melange ring spun yarns woven into a soft cottom percale. Mini flange on duvet covers & shams. Pleat details on flat sheet & cases.